The estimates presented in this report are based on data from Eurostat, Europe’s statistical agency. Eurostat is a central repository of the European Union’s economic, environmental and population data. Its goal is to provide high-quality statistics that enable comparisons across countries. Eurostat also provides nationality and country of application data for asylum applications. It contains data on the number of asylum applications submitted, the number of applications withdrawn, application decisions (first-time and final decisions) and data on those ordered to leave, also known as returns. These publicly available data are not linked together. Consequently, Pew Research Center arranged these data to produce estimates for the status as of the end of 2016 of Europe’s asylum seekers who applied in 2015 and 2016. Public data on Europe’s asylum seekers are anonymized, meaning that analysts cannot track individuals across various stages of their asylum application process. This anonymization does not allow analysts to determine quickly the legal status of asylum seekers in a specific migration wave. Consequently, estimation methods must be used to calculate the number of people in each possible phase of the application process (approval, rejection and waiting for a decision as of the end of 2016). The estimates in this report are based on calculations using both country of application and asylum seeker nationality information. For example, the total number of Syrian asylum applicants across Europe is based on calculations for the number of Syrian applicants in Germany plus the number of Syrian applicants in France plus the number of Syrian applicants in Sweden and so on. In the same way, the total number of asylum applicants in Germany is based on individual estimates by nationality, or, for example, the number of Afghan asylum applicants in Germany plus the number of Iraqi asylum applicants in Germany and so on. All estimates were conservatively rounded to the nearest 5,000 to avoid overstating the level of precision associated with the estimates. Detailed estimates by nationality and country of application are provided only for asylum seeker groups of 20,000 or more in this analysis. Complete data from Eurostat were used through the end of 2016. Consequently, the figures in this report on the status of asylum seekers applying for refugee status in 2015 and 2016 reflect applicants’ status as of Dec. 31, 2016. Across the European Union’s 28 member countries plus Norway and Switzerland, some 2.5 million first-time asylum applications were filed in 2015 and 2016. With the sudden movement of hundreds of thousands of asylum seekers into Europe during these years, however, it is likely that this total for 2015 and 2016 includes applications filed by the same people in multiple countries. It is also possible that some asylum seekers returned to their home countries or were remaining in Europe in some other legal status before proceeding further in the asylum seeker process. Consequently, it is important to obtain an estimate of the unique (or “net”) number of applicants across Europe during this time period. Applications are not the same as arrivals. It can take several months for newly arrived asylum seekers to make formal applications for asylum and get included in monthly statistics. Applications represent individuals, however, not households. Regardless of age or family relationship, each person claiming refugee status must file an asylum application. It is possible some people in refugee situations entering Europe never submit an asylum application. This report does not include those people. EU countries as well as Norway and Switzerland lawfully agree to the Dublin Regulation, which states that asylum seekers are to apply for refugee status in the first European country they enter. Germany temporarily waived their participation in the regulation during the refugee surge of late summer and early fall of 2015. Consequently, many refugees traveled through Greece, making their way north and west to Germany and other destinations using a route through several Balkan countries as well as EU member countries such as Hungary and Austria. Some asylum seekers applied for refugee status in transit countries before making it to their desired destination of Germany or other countries. Many asylum seekers who applied in Hungary and Austria, for example, later had their applications withdrawn. Once asylum seekers submit their applications, they are given food, medicine and shelter as they wait for their case to be reviewed for the first time by immigration personnel. This wait time can range from a month to more than a year, depending on the nationality of the asylum seeker as well as the country of application. Eurostat provides quarterly decision data (acceptance or rejection) for first-time asylum applications. But, since it can take some time for those applying in early 2015 to hear a decision on their case, quarterly decision data used in these estimates needed to be delayed by the application wait time in each country. For example, if a European country’s average wait time for application review was six months, then decision data for the third and fourth quarters of 2015 (allowing for six months for asylum seekers filing applications in early 2015) and all of 2016 were used. Researchers primarily used estimated wait times from AIDA (Asylum Information Database), a database service that collects data on the asylum seeker process for selected European countries. 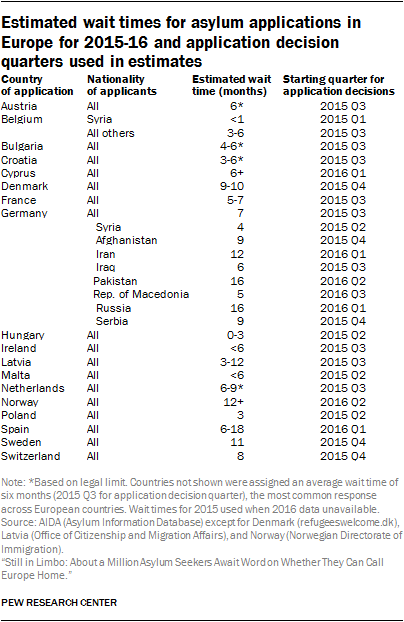 Most wait times are in months, and the nearest quarter of asylum decision data from Eurostat (usually the following quarter after the reported average waiting period) was assigned to the country of application.11 In some countries of application, wait times are specific to certain nationalities. Decision data from Eurostat also provide the number of asylum seekers whose applications were rejected. The estimated average wait times in calculating the number of rejected applications were used in the same way as approved applications to estimate the number of rejected applications from 2015-16. As with approved applications, only data on applications yet to receive a first decision were used. Once an application is rejected, there are three possible directions the applicant’s status can take: (1) appeal the decision – a process that can take months or years to pursue while they remain in Europe on a temporary, yet legal basis; (2) be returned to their home country or some other non-EU country; or (3) continue to reside in Europe, despite being unauthorized to do so. Pew Research Center estimated the likely number of applicants in each category. Annual counts of rejected asylum seekers with appeal decisions are available from Eurostat. However, the submission date of their application appeal is unknown. Consequently, data for the number of appeals are comprised of rejected, first-time applicants from as little as a month prior to several years before. An estimation procedure is needed to calculate the share of rejected, first-time applications during 2015 and 2016 that were likely in the appeal process as of the end of 2016. A portion of asylum seekers each year are returned to their home countries or another non-EU country after having their application rejected. The annual number of foreign nationals who were ordered to leave and have effectively left EU member countries, Norway and Switzerland is available from Eurostat. These data, however, are not specific to asylum seekers. The data represent any person (asylum seeker, migrant worker or visitor) found to be living illegally in Europe. Remaining, rejected applicants not estimated to have appealed the rejection decision or who have not been returned to their home or other non-EU country were deemed to be asylum seekers residing in Europe without authorization. In some countries it is possible that a portion of this group may have some kind of temporary, legal status, such as humanitarian need, to temporarily remain in Europe. Others may not be in Europe and had left before the end of 2016. The remaining number of asylum applications that have been neither approved nor rejected using the estimation techniques earlier explained are considered to have been under review for the first time as of the end of 2016. In other words, these applicants are waiting for their initial application decision. This number of applications is calculated by subtracting the total number of decisions (approved and rejected) from the total number of applications (or “net” after the removal of withdrawn applications) received in 2015 and 2016. Eurostat provides a monthly tally of the number of pending applications yet to be processed, but the actual submission date of these applications is unknown. Consequently, the total number of pending applications includes all previous submission dates, as little as a month prior to several years before. And, Eurostat’s number of pending applications can also include duplicate applications that would later be found to exist across two or more countries. Nonetheless, the Center’s estimates of net applications received in 2015 and 2016 still under review as of the end of 2016 were compared with Eurostat’s number of pending applications also at the end of 2016. In most countries of application, the number of pending applications reported by Eurostat was the close to the number of pending applications estimated in this study. For the purposes of results presented in this report, “waiting” applicants include those both waiting for a result in their initial application (the estimate calculated in this last step) as well as those waiting for an appeal decision (rejected applicants who were likely in the appeal process) explained earlier.